The 606260 Movado Belamoda Women’s Watch is characteristic of a collection which takes on a decidedly genteel look typical moreso of the Belamoda collection than some of Movado’s more conservative designs. The Belamoda features a circle link jewelry chain and a bezel with natural cut diamonds, water-resistant round high-polished stainless steel case and museum black dial. The circle-link jewelry chain and natural cut diamonds on the bezel give the 606260 Movado Belamoda Women’s Watch a more showy quality than its counterparts from the Bela collection—in large part because its design is one that deliberately resembles a jewelry piece rather than a simple timekeeping device. Because of this, some may find that it has a stronger appeal for formal wear than for everyday use. Even still, its showiness remains subtle enough that it maintains a capability for everyday casual use for most. The 606260 Movado Belamoda Women’s Watch comes built with a round, high-polished stainless steel case and a crown with a water resistance of up to 30 meters. The circle-link jewelry chain fastens using a jewelry buckle. Hand movement is battery operated with Swiss Quartz. 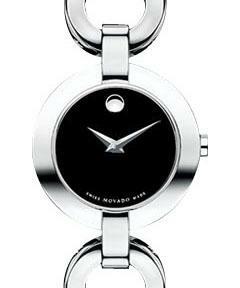 The 606260 Movado Belamoda Women’s Watch retails at an MSRP of $695.00 and comes with a Two-Year Manufacturer’s Warranty at purchase.